Many of us have those points in life when we step up our training frequency. We do so mainly because we get excited about something new we’re dabbling in, have some pretty lofty goals in mind or can’t fathom the idea that maybe too much METCON training is a bad thing. On the other hand, others have it so engrained in their daily routine, that they just can’t seem to take a day off. Fact: It is better to perform at 100% of your ability level with fewer workouts per week than to workout every day at 80%. In order to avoid over-training and eventually injury, you’ll need to recover properly and train with intelligence. We’ve all heard the expression “too much of a good thing (exercise) can be harmful. Caused by skipping rest/recovery days, over-training may have many negative consequences that can have long lasting adverse effects. Insufficient recovery and rest can cause depression, weight gain, endocrine system fatigue, lack of sleep, and a lead to a compromised immune system. 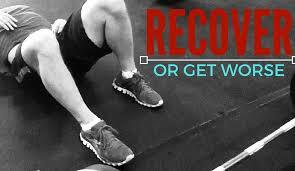 If that isn’t enough, without proper recovery you are more likely to get injured. Overuse of muscles, tendons and ligaments creates a constant state of inflammation within the body and its joints. When this occurs, tissue breakdown occurs and the injury cycle has started. Take 1-2 days off per week from the gym. No you don’t have to abstain from movement. Try some restorative yoga, light stretching/mobility drills. Go for a walk, bike ride or a hike. Just stay away from beating yourself up. Focus on your sleep. Sleep is the most important time to recover. Sleeping 7-10 hours per night will help to provide mental health, hormonal balance, and muscular recovery. Nutrition/Hydration: Food and water play a significant role in recovery. Many foods and beverages contain harmful toxins and harms the body’s ability to recover and rest. Eat a balanced diet of organic foods, high in vegetables, fish, lean meats and healthy fats. Try to eliminate/avoid most sugar and processed foods. Water intake is simple…drink a ton! Estimated at half of your bodyweight in ounces. Stretching/Self-Myofascial Release: To move well you need to be pain free. In your days off spend 15-20 minutes performing mobility, stretching and self myofascial release exercises that focus on your hips, ankles and shoulders. You can attempt to identify other areas but these are the three biggest areas we can all improve on so chances are these will be enough. The above recovery strategies are just some basic recommendations. As individuals, we can get much more specific. Try adding these suggestions into your “recovery/rest” days for several weeks and try paying specific attention to how your performance quality within your workouts improve. If you are struggling to accomplish your goals, want to feel awesome and perform on a higher level, please contact us today!